Have you taken part in a Meetup or a Tweetup - aka a Meetup organized via Twitter using a specific hashtag? I recommend that you do. Both are powerful means for building community. Particularly if you've started engaging with others via social media, Tweetups and Meetups allow you to meet in person people with whom you may only have been interacting with virtually to that point. That's where the magic happens! I've noticed it time and time again - at my first NYC Blogger Meetup: Night of the Iguana in 2007; at the ultimate blogger Meetup in April 2008: Blogger Social which I describe in Back From Blogger Social 2008 - NYC - interacting with people online by reading their blogs or tweets and exchanging ideas makes for intense in-person meetings where you 'know' the person despite never having met them. You already have the basis for conversation established and your next exchanges can go far beyond superficial cocktail party chatter. Since those early days, Meetups have become more formalized and tend to refer to regularly occurring meetings and conversations. In fact, you can search for ones of interest in your geographic area by searching through Meetup.com. Tweetups, on the other hand, retain an impromptu, one-off quality which can take a variety of forms. You learn about them by following a specific hashtag [#] associated with an event taking place. Note from the following examples not only the range of formats, but also interaction. At Coverings 2010, I participated in a low key Tweetup that I discovered while following #Coverings on Twitter in anticipation of attending and presenting at Coverings 2010. My fellow Twitter friends are pictured above: Paul Anater, Zoe Voigt, Veronika Miller, Bill Buyok, Marilyn Russell, Arpi Nalbandian [not pictured here; I originally met Arpi in person at Surfaces after many Twitter exchanges]. David Parmet describes a 150 person Tweetup in this post titled What Every PR Person Can Learn From The #NASATweetup. Neville Hobson describes an 80 person music-based #ealingtu Tweetup in The Success of the Ealing Tweetup. In this last example - which is more about Twitter than Tweetups, but does include one - Twitter marvelously brings to live Moliere's 400 years old play "Le Bourgeois Gentilhomme", as each character embraces his/her own Twitter stream, tweeting in verse even and engaging with new audiences. The project culminates in a 50 person Tweetup at the Theatre du Nouveau Monde before the performance which I bet was electrifying! From Gaurav Mishra, see Case Study: How a Theatre Used Twitter to Introduce a Young Audience to a Moliere Play with link to the video: Molière Goes Twitter. I hope you'll be on the lookout for upcoming Tweetups at the next trade show or conference you attend. You'll be amazed at how they help build community. Will you let know your experience? First, thank you for mentioning me in this post! And, there you have it, the power of a Tweetup: the ability to meet, network, and develop powerful relationships that support each other. The Coverings 2010 Tweetup was my first and I have participated in two more since. Not only do they build community, they extend community. I did not think I would have the opportunity to interact with marketing gurus (like yourself), journalists and designers on a very personal level. Nor, did I think about them being in "my tiny handcrafted tile community." Wow, what a difference a day with a Tweetup can make! Bill, I like that you say 'extend community.' That captures the magic of the Tweetup. Thanks VERY much for being part of my community. 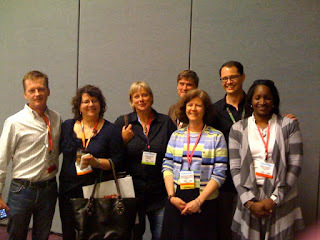 I hope we get together again before Coverings 2011, but if not I look forward to seeing you then.